I teach flute at Wilfrid Laurier University and U of Guelph, Canada; I perform around the globe. I can't wait to help you with your flute goals! I love teaching and have taught flute for over 25 years at all levels from beginner through advanced. I research flute teaching methods and resources and blend many approaches into my style of teaching. This means I have a wide variety of tools so I can use the right approach for each individual student I work with. I enjoy challenging my students to do their very best and to take their musicianship to the next level of excellence. But we have a fun along the way too! 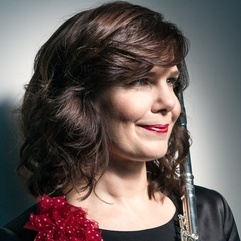 Whatever your repertoire or goals, I want you to play to the best of your ability, and I hope to bring ideas to you that will have you look at your music and flute playing from new and different perspectives. I also love wooden flute and play Scottish and Irish traditional music for fun on my 8-keyed Rod Cameron flute. Doctorate of Musical Arts in Peformance. Studied flute with Nora Shulman, Principal Flute of Toronto Symphony. Studied traverso with Alison Melville. Thesis on 18th century Scottish Flute repertoire. Flute teacher of Music Majors and non-majors. Teach flute to BA music majors and minors. Directed Flute Ensemble. Taught applied flute lessons to flute majors and non-majors. Taught Instrumental Methods (Flute) course to music education majors. Taught Instrumental Methods (Flute) to music education majors. Thank you so much for all of your wonderful inspiration!!! Your comments were exactly what I needed to move forward in my playing and as a musician. I look forward to more lessons with you in the future. In each instance I have worked with Laurel, her drive and passion for education is always evident, and is truly contagious! She cares for each student with whom she works, accommodating their needs while also providing challenges and room for growth. I am so glad that I took lesson from you! You truly are one of the first ones to show me just how powerful music really was. I am happy to inform you that I will continue my music as a music major at NYU in New York City!